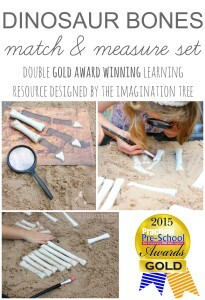 Create some DIY dinosaur bones for using in sensory play activities and learning about maths at the same time! Lots of different ways to play and learn and wonderfully appealing for all those little palaeontologists out there, this would be great in the classroom or home. 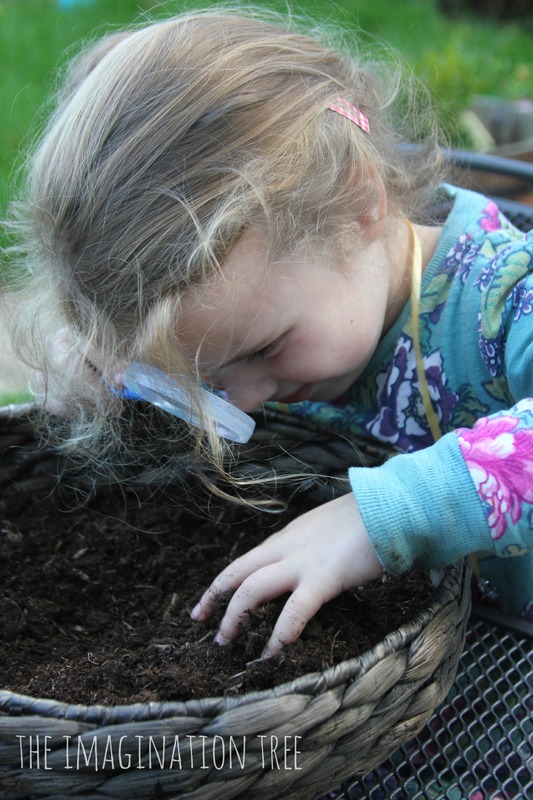 My 3 year old has recently declared a love for dinosaurs and it has even great fun coming up with some new resources and activities centred around that theme. When I was teaching Reception, we often used to use dinosaurs as a themed topic and the children absolutely adored learning about them. We always had fun applying our themes to every area of the curriculum to tie it all in together. I had the idea to make the girls some DIY dinosaur bones for digging, uncovering, sorting, matching, measuring and counting and general palentogoist play! 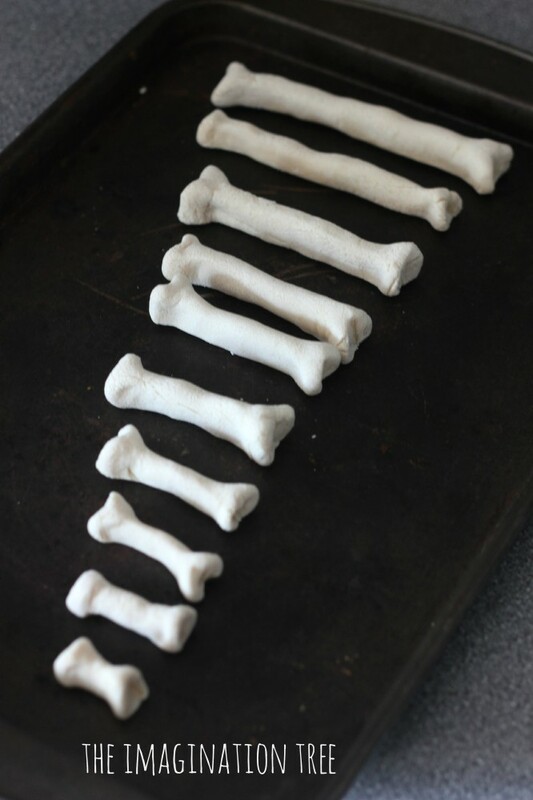 The bones were super simple to make, using our very easy salt dough recipe here (just 3 everyday ingredients.) We made the dough together and then kneaded it until it was smooth and elastic like play dough and then rolled it out into 10 sausage shapes. 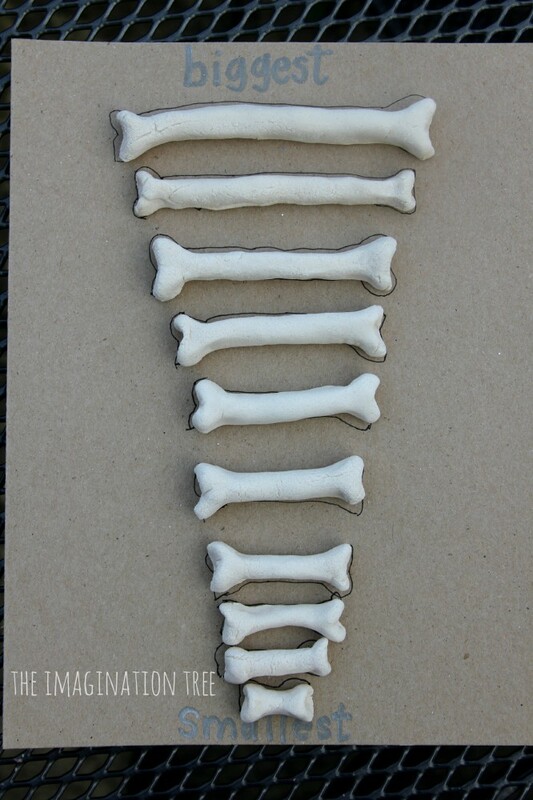 I made the rest of the activity a surprise and finished the bones myself, making them range from short to long in 10 different lengths. They went into the oven for 2-3 hours at about 120 C in a normal oven (around 250 F.) You may need to reduce the temperature for fan assisted ovens. When they were ready I drew around them onto card in size order to make a matching sheet for the Dinosaur Detectives! 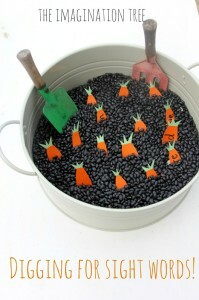 Then I hid them in a shallow basket of fresh soil with a magnifying glass and pastry brush ready for detective work. 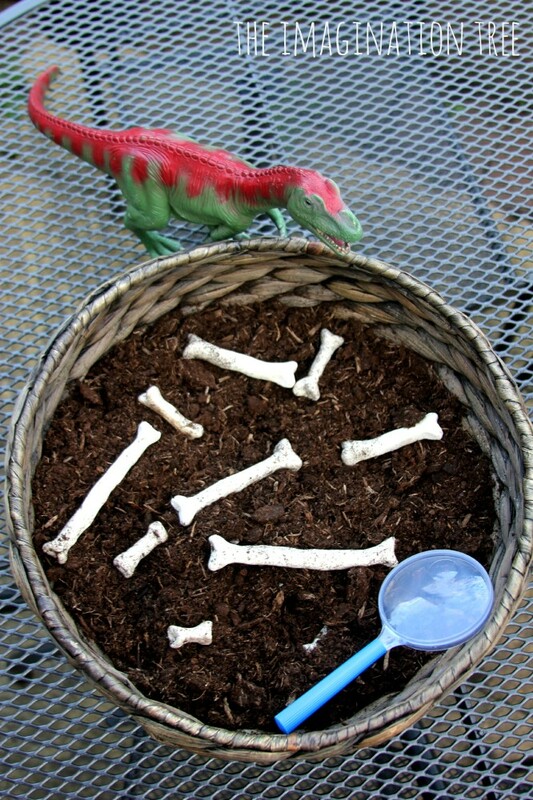 I set them the task of finding the 10 missing dinosaur bones. Could they find, match and count them all to check they were all found again safely? Ready, steady, go! 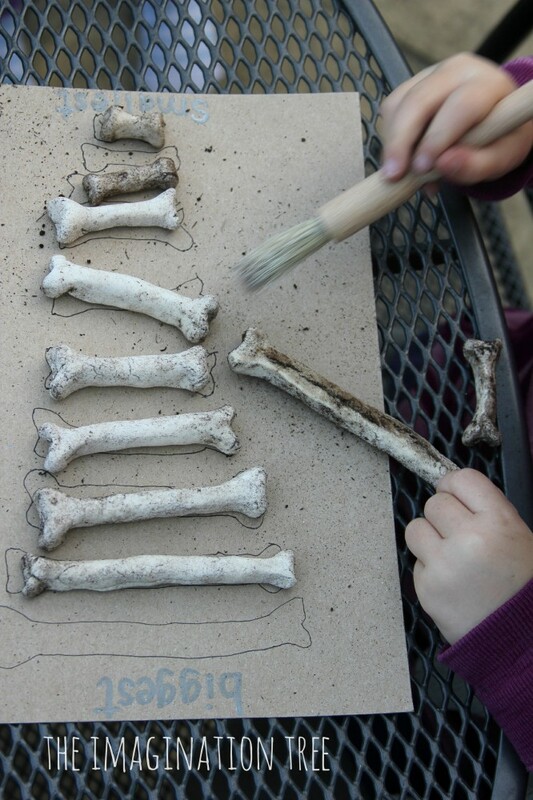 The pastry brush turned out to be really useful as the bones picked up the dirt in a very realistic way! They loved brushing it off and finding where to match each one in their collection. You could, of course, remove the matching card and ask them to sort them into the correct lengths without a guide, depending on the ages and abilities of the child. When they had played this a few times, they took the bits off the play a hide and seek game with them on a larger scale around the house and garden. Baby Bean was so excited to search for them too! They counted up to 10 each time to check they had found them all and worked out how many were missing on the occasions that some hadn’t been found. “Oh no! there are only 7 on the board. that means there must be……3 missing!” In a teaching situation you could deliberately create a certain number of missing bones and ask them to work out how many more they need to find. Great problem solving and addition/ subtraction skills in real life contexts! The bones have been clean off and stored with our other DIY resources for other games in the future. The great thing about salt dough is that it’s really cheap and easy to make things with, and lasts for a very long time. 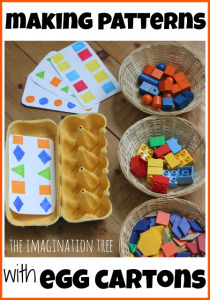 Check out all our Play and Learning Pinterest Boards too! I can’t wait to try this with my three year old. If anything’s going to get him enjoying counting this will be it! This is awesome, Anna! You are so clever! 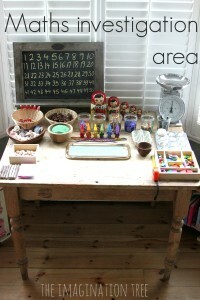 Brilliant idea that I plan to use with my early years students as an idea for them to use as sensory play activity. My only observation is the use of biggest and smallest. As you are comparing length longest and shortest should be used. 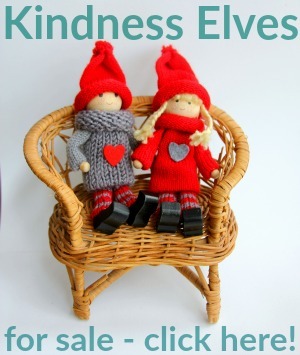 This is a wonderful activity! I was thinking as I was reading along “those would be easy to make with the salt dough recipes” and sure enough, that’s what you made them out of! 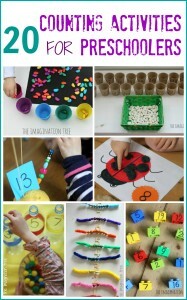 You could have a lot of creativity in this and use different things to hide – counting bugs too (fake ones!!). 🙂 Thanks for posting. So simple, and so much fun. What a funny and useful learning idea! I like it! Wonderful! Inspired by this, we created a Halloween skeleton comprised of 12 salt-dough pieces. I drew around the various bones in gold pen on black card and hid the pieces around the house. The children had a wonderful time searching, matching the pieces to the outline, and counting how many more they needed to find. 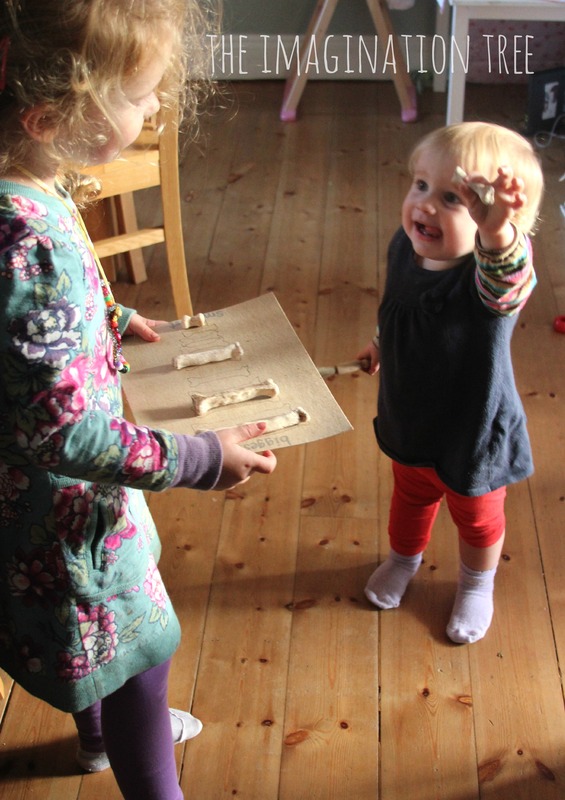 They also loved hiding the pieces themselves (sometimes a bit too well…) Thanks Anna! 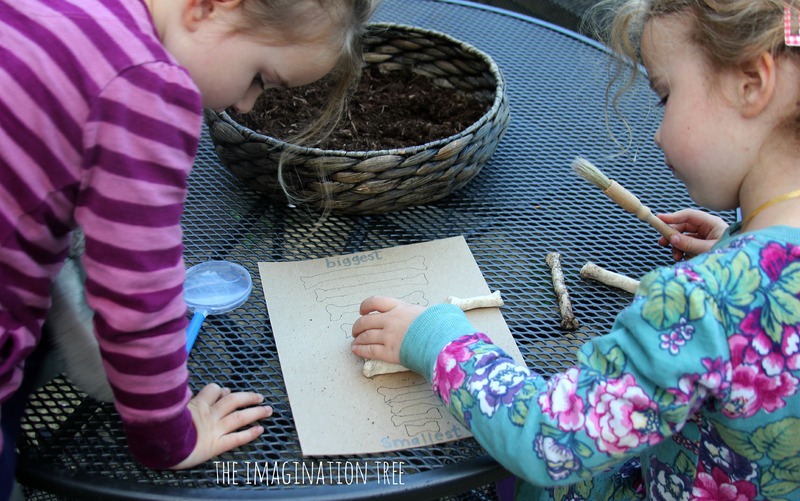 This is great but sad at the same time, we just cover the letter Dd this week and i couldn’t find any idea on how to do bones of dinosaurs, which is funny because my toddlers and i where talking that it would be nice to go on a expedition for dinosaurs bones. But i think that we will extend the letter and mix it with other one so they can have fun with bones. 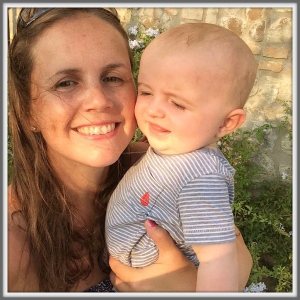 This site has just been recommended to me as I was after some knew ideas for my little boy.